The proprietary Surround: AI processing technology from Yamaha is engineered to work with any home theater format to help it sound more natural to listeners. Select products such as the Yamaha CX-A5200 AV Preamplifier incorporate the company's proprietary Surround:AI surround sound technology that takes surround content to new levels of realism. Over the past couple of years, a trio of immersive audio, object-based audio formats have reignited the public’s interest in home theater. With home theater’s popularity surging again through technologies like object-based sound and 4K video, the audio/video company Yamaha has upped the performance ante of surround sound. Not long ago, Yamaha, whose heritage includes the professional audio market and advanced products such as mixing consoles and arrays, applied its knowledge of digital sound-field processing (DSP), and applied that knowledge to a new generation of home theater products. Using its knowledge of DSP technologies, Yamaha developed its Surround:AI technology, which is a format option that can be applied to any surround sound format to dynamically optimize each scene within a movie, show or game. Explained simply, Surround:AI optimizes the DSP settings for each scene in a movie five times per second and instantaneously adjusts that content to deliver a more natural listening experience. For comparison purposes, Surround:AI treats audio the same way the dynamic HDR (high dynamic range) video format Dolby Vision treats content when compared to a static HDR format such as HDR10. These dynamic adjustments are more demanding on the processing engines of video products, but the dynamic adjustments produce a better image. Surround:AI does the same thing for content in the audio domain. More specifically, Surround:AI analyzes each scene in real time. The technology focuses on distinct elements within a scene such as spoken dialog, background effects and ambient music to tailor that content to make it more immersive without disrupting the mood of the scene. Phil Shea, content development manager, Yamaha, points out that Yamaha has been a leader in the field of DSP technologies for more than 30 years, and Surround:AI brings DSP capabilities to a new level. “Our receivers do the decoding of the content, regardless of what type of content it is—that is the directional cues. The processing just needs to be done accurately. What Surround:AI does is an overlay, and the whole idea is to transport you outside of your listening room. Shea emphasizes the processing to handle the demands of Surround:AI is high. 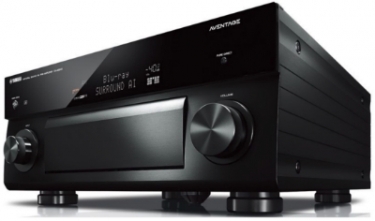 To ensure the integrity of the content the company has added a third processor to the top of the line Yamaha AVENTAGE AV receivers to incorporate the Surround:AI option. From a consumer perspective, the addition of the third processor also helps deal with issues that take the enjoyment away from activities as basic as watching TV by alleviating the need to think about and selecting the perfect listening mode. “In the past integrators have gone with straight decoding because they don’t want to risk anything—it’s the safe way out. With Surround:AI they can let it go and not have to worry about sound quality and sound clarity issues,” he notes. Found in flagship products such as the $2,700 AVENTAGE CX-A5200 AV processor, Yamaha points out the experience that Surround:AI produces is done through a combination of processing, system planning and calibration. Dealers that employ the company’s proprietary Yamaha Parametric Room Acoustic Optimizer (YPAO) calibration suite can fine tune their home theater installations to help systems adapt to the unique conditions within a home space, and in turn feed the Surround:AI processing valuable room information. “When we do the room calibration not only do we calibrate the speakers, we also take the additional step to measure the room acoustics, and we feed that information into the Surround:AI algorithms to tailor the DSP,” explains Shea. Shea and his colleague Joel Kennedy, marketing communications manager, AV, admit that it is one thing to talk about Surround:AI and another thing to experience the technology. Kennedy says that it is easy to turn Surround:AI on and off, but simply turning the technology on and off doesn’t fully show off the capabilities of the Surround:AI affect on multichannel audio. To fully demonstrate how dramatically Surround:AI affects the sound quality of existing surround sound formats Shea recommends that dealers can follow a few simple steps. Without getting into the technical elements of what makes Surround:AI a technology that complements today’s consumer lifestyles, Shea adds that Surround:AI eliminates the urge to constantly tweak AV system settings. “The simplest way I can say this is it’s a more intelligent way to think about your entertainment experience, rather than constantly playing with a remote,” Shea stresses. Professional integrators interested in demonstrating Surround:AI to their clients should check out these demo clips that Yamaha recommends.